As agencies modernize their IT systems and embrace an array of digital platforms, applications are being asked to perform at quicker rates than ever before. However, a recent Riverbed survey revealed unreliable federal applications are impeding agency effectiveness, frustrating federal employees, and jeopardizing the success of IT modernization efforts. When it comes to improving application performance issues, end-to-end visibility across your agency’s infrastructure—from the networks, to apps, to end users—is crucial. That’s why we’re happy to announce USGv6 Certification for SteelCentral AppResponse 11, a single solution that combines network forensics and historical analysis, application analytics, and end-user experience monitoring to speed problem diagnosis and resolution for application issues. USGv6 certification ensures Riverbed’s powerful application performance solution can now be safely deployed in the growing number of environments where IPv6 is in use, enabling Federal agency core missions and the applications they rely on. IPv6 increases the number of Internet addresses, allowing more computers and devices to be connected online, which will support continued innovation in how government delivers services. The use of IPv6 has doubled every year for the past three years and support for IPv6 is now required by many governments, service providers, and enterprises. While the move to IPv6 is now critical for U.S. government agencies with the exhaustion of IPv4 addresses, IPv6 also enables government networks to scale for new initiatives like cloud computing and mobile. As a way to future-proof network infrastructure and embrace digital transformation initiatives, all civilian agency networks are now required by law to be IPv6-capable and to only procure products that are USGv6-certified. The United States Government IPv6 Conformance Certification (USGv6) is a set of technical standards for the acquisition of IPv6 capable hosts, routers, and network security devices. The National Institute of Standards and Technology (NIST) created the USGv6 conformance standards to support adoption of IPv6 in the U.S. government. The University of New Hampshire InterOperability Laboratory (UNH-IOL) tested Riverbed SteelCentral AppResponse on all fields—including the USGv6 Basic, Stateless Address Auto-Configuration (SLAAC), and Addressing Architecture—confirming SteelCentral AppResponse is now in full conformance with mandatory fields and can support deployment of secure, end-to-end, IPv6-enabled network services. Fig 1. 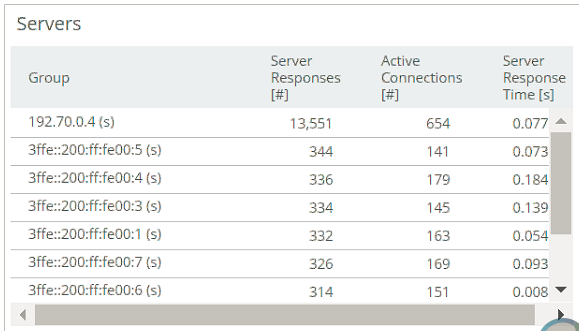 SteelCentral AppResponse 11 can mix and match IPv6 and IPv4 addresses in the same charts. The UNH-IOL is the only North American laboratory offering ISO/IEC 17025 accredited testing designed specifically for the USGv6 Test Program. The test program designated by NIST provides proof of compliance to IPv6 specifications outlined in current industry standards for common network products. It is meant as a strategic planning guide for USG (United States Government) IT acquisitions to help ensure the completeness, correctness, interoperability and security so as to protect USG investments in the technology. Download the Riverbed SteelCentral AppResponse SDOC here. Start your free 30-day trial of SteelCentral AppResponse here.